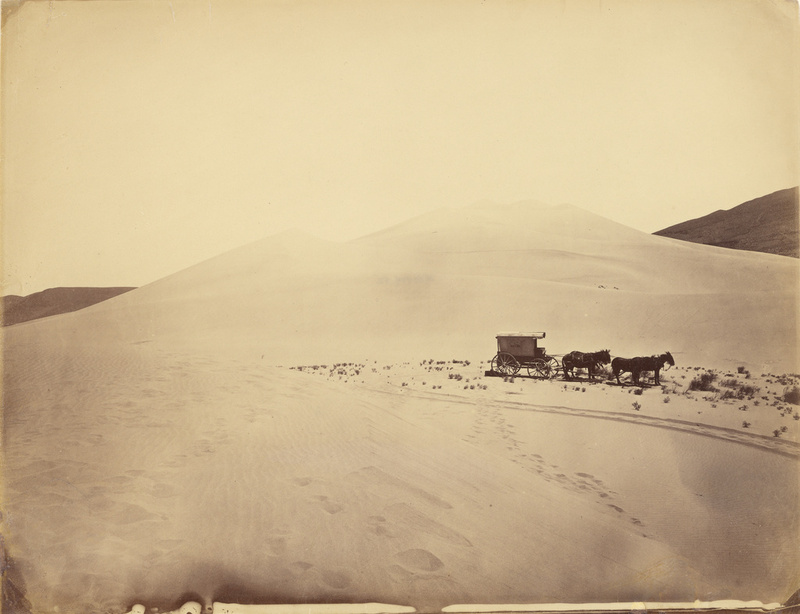 (Verso) inscribed in pencil: "Moving sand hill 500 ft. high"; in pencil, at lower right edge: "O'Sullivan-3"
Timothy O'Sullivan's darkroom wagon, pulled by four mules, entered the frame at the right side of the photograph, reached the center of the image, and abruptly U-turned, heading back out of the frame. Footprints leading from the wagon toward the camera reveal the photographer's path. Made at the Carson Sink in Nevada, this image of shifting sand dunes reveals the patterns of tracks recently reconfigured by the wind. The wagon's striking presence in this otherwise barren scene dramatizes the pioneering experience of exploration and discovery in the wide, uncharted landscapes of the American West. O'Sullivan's photographs from the 1867 Geological Exploration of the Fortieth Parallel expedition were intended to provide information for the purpose of expanding railroads and industry, yet they demonstrate his eye for poetic beauty. The J. Paul Getty Museum Handbook of the Collections. 7th ed. (Los Angeles: J. Paul Getty Museum, 2007), p. 301, ill.
Heckert, Virginia. Light, Paper, Process: Reinventing Photography, exh. cat. (Los Angeles: J. Paul Getty Museum, 2015), p. 109, fig. 27.